These new meters have up to six sensors for measuring pH, ORP, EC, DO, temperature and barometric pressure in addition to seven interpreted parameter including TDS, seawater salinity, and pH in mV. The pH, ORP, EC and DO sensors are field replaceable and mount into a single digital probe that is less than two inches in diameter. These sensors are protected by an ABS plastic cage that is weighted with a stainless steel ring allowing for the probe to achieve a maximum depth of twenty meters in water. The new meters, HI98194 (pH/ORP/EC/DO/Temp/barometric pressure), HI98195 (pH, ORP, EC, Temperature), and HI98196 (pH/ORP/DO/Temp/barometric pressure) are designed for demanding applications. The meter is rugged and waterproof to IP67 specifications while the probe with the sensors is IP68 rated. These meters are ideal for field use and come supplied with a rugged carrying case containing the necessary probes, solutions and accessories needed for field measurements. 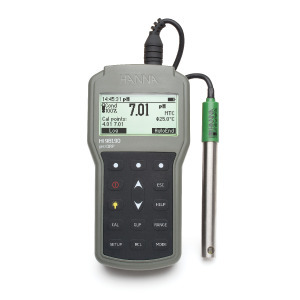 Hanna Instruments, Inc. is the world’s largest privately held manufacturer of electro-analytical instrumentation. Since 1978 Hanna has produced practical, cost effective devices for Lab, Environmental, Food and Industry applications. We offer a wide array of instrumentation, from research grade bench tops, and ISE’s, to single and multiparameter portable meters for testing pH, conductivity, DO, turbidity and more. Hanna has 60 offices worldwide to insure exceptional levels of service and support anywhere in the world.